Peppermint gets all the glory when it comes to chocolate patties. I thought it was time to let another flavor shine. 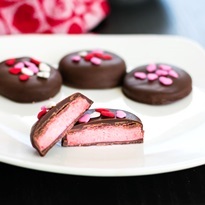 And since Valentine’s Day is on the horizon, pretty pink strawberry patties seemed like the perfect option. Freeze-dried strawberries infuse the filling with flavor, not moisture, and also provide a blushing hue without need for food coloring! These strawberry patties are actually very easy to make, but it helps to have some tips out of the gate to avoid any initial fumbles. It’s easy to be tricked by the crumby appearance of the filling when mixed. But don’t be tempted to add more liquid before you do the press test. It comes together into dough in your hands, even when it looks like coarse crumbs in the bowl. Too much moisture will make the dough a sticky mess that you can’t easily roll out, pick up, and dip. I prefer to use coconut cream for the liquid for the best texture and because it is the least finicky. If you need to use a milk beverage, start with as little as possible and add only as much as needed. It’s easy to go from too dry to too wet when using a very fluid liquid like this. For the coconut cream, I just skim a little from the top of an unshaken can of full-fat coconut milk. There’s no need to chill it first; thick coconut milk works great. Yes, there is dairy-free chocolate! My go-to brand is honestly Enjoy Life. They offer dark and rice milk chocolate bars, chocolate chunks, dark chocolate morsels, and the mini chips shown in the photo above. 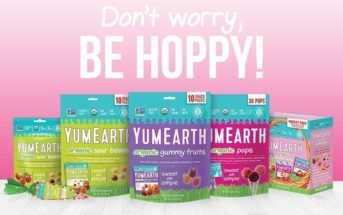 All of Enjoy Life’s tasty products are non-GMO verified and free-from gluten and 14 common allergens, including dairy, egg, wheat, peanuts, tree nuts, soy, sesame, sulfites, lupin, mustard, fish, and shellfish. And to easily spot them, Enjoy Life products now come in allergy-friendly teal packaging. If you’re vegan, make sure to pick certified vegan or organic powdered sugar. There are several vegan sugar options on the market, and they must be vegan to receive organic certification. So this recipe is well within your reach! For those who prefer a natural, non-hydrogenated shortening option, palm shortening works fabulously in this recipe. I know that many of us are concerned about orangutan habitats and sustainability, but most of the palm shortening brands are certified by the Round Table on Sustainable Palm Oil. I suggest reading the information they provide to better understand the industry, if you are concerned. This post is sponsored by Enjoy Life Foods. 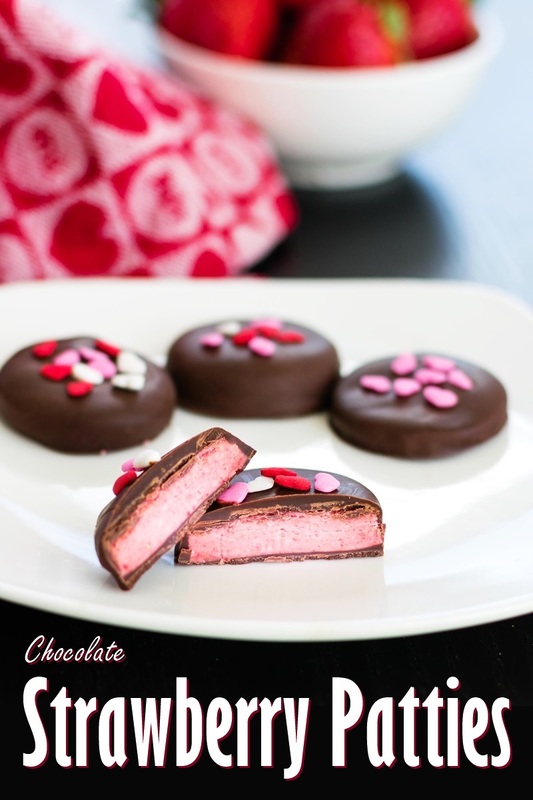 They asked me to create an original, decadent chocolate dessert recipe to share with you before Valentine’s Day, and I think these strawberry patties fit the bill! For more allergy-friendly chocolate treats enjoy my recipes for Chocolate No Bake Cookies, Dirt Pudding Cups, Chocolate Butter Cup Brownies, and Cookies ‘n Ice Cream Bon Bons. Sometimes readers share recipe feedback with us via social media. 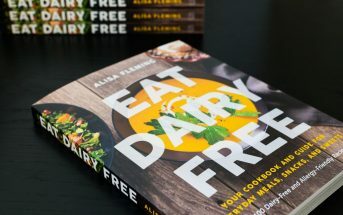 By ingredients, this recipe is dairy-free / non-dairy, egg-free, gluten-free, grain-free, nut-free, peanut-free, soy-free, vegan, vegetarian, and top food allergy-friendly. Think peppermint patties, but fruit-flavored instead! I chose strawberry for the filling because their pink hue is perfect for Valentine's Day. But you can use freeze-dried bananas, blueberries, or raspberries for other chocolate-covered flavors. 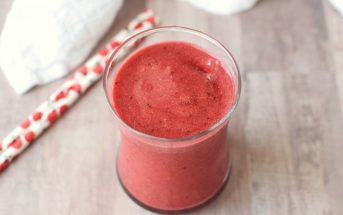 Place the strawberries in a spice grinder and process until powdered, about 30 seconds. Sift the powdered sugar and powdered strawberries into a medium mixing bowl. Add 3 tablespoons shortening, 1 tablespoon coconut cream, and vanilla. Beat on low speed with a hand mixer (to avoid clouds of powdered sugar!) until crumbs form. Pinch the crumbs together to see if they are cohesive. If not, add more coconut cream, only as needed. It will still be crumbs, and look a little dry, but will come together when pressed. Bring the crumbs together with your hands, kneading it lightly to form cohesive dough. The warmth of your hand will also make it softer and more pliable. Place the dough on a sheet of parchment paper. Top it with another sheet of parchment paper, and roll it out to roughly ¼-inch thickness. Using a small 1½-inch biscuit cutter, or a small cookie cutter that isn't too intricate, cut the dough into shapes and place them on a parchment-lined sheet. 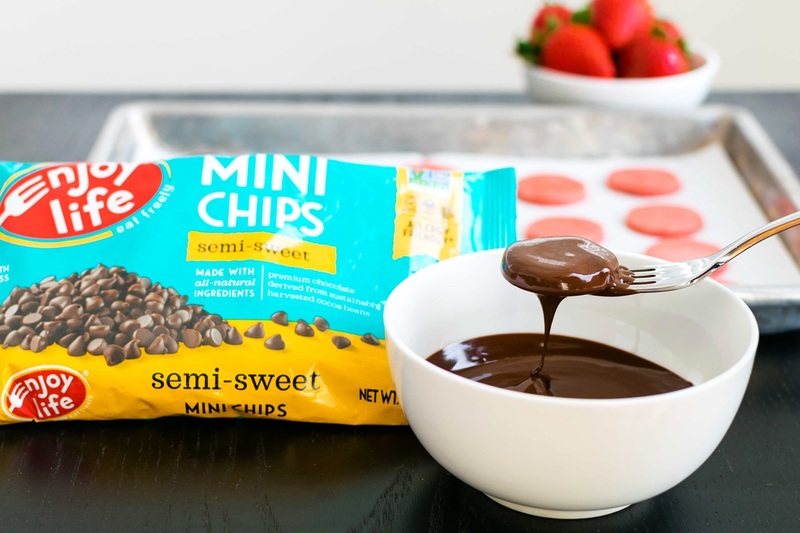 Put the chocolate chips and remaining 1 tablespoon shortening in a microwave-safe bowl. Heat on high for 30 seconds and stir. Heat on high for another 30 seconds and whisk until smooth. If lumps remaining, heat in 15 second intervals until the chocolate is just melted. Do not overheat. One by one, drop the strawberry filling pieces into the chocolate, flip to coat, and remove with a fork to let excess chocolate drip off. Return the chocolate-covered patty to the parchment paper. Place the sheet with the patties in the freezer for 20 minutes, or until the chocolate is set. 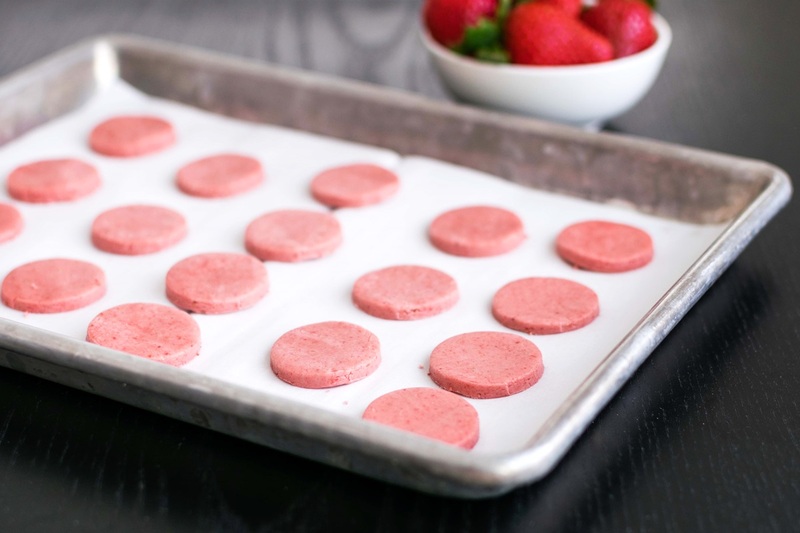 Store the strawberry patties in an airtight container in the refrigerator for up to 3 days, or in the freezer for longer. They will keep at room temperature for 1 day. The freeze-dried strawberries take on moisture so you don't want to leave them at room temperature for too long. Coconut-Free Option: You can substitute your favorite allergy-friendly milk beverage, but start with just ½ tablespoon and add more only as needed. See the Recipe Tips in the post above. Freezer Note: If the filling is a little soft, you can freeze the sheet while you prepare the chocolate, or for 20 minutes. This will cause the chocolate to set up more quickly when you dunk the filling. So you might need to reheat the chocolate as you dip, or use a double broiler set up to keep it melted. I actually tried these last year with raspberries as my brother is allergic to strawberries. It was good! That looks way too cute to eat! I wanna make some for Valentine’s Day! These are just stunning Alisa! And I love using dried fruits instead of fresh, the flavor is so much more intense as well as the color. I do this for frosting and cream cheese, but these treats are so creative and I’m dying at how delicious they must be. My daughter would love these! 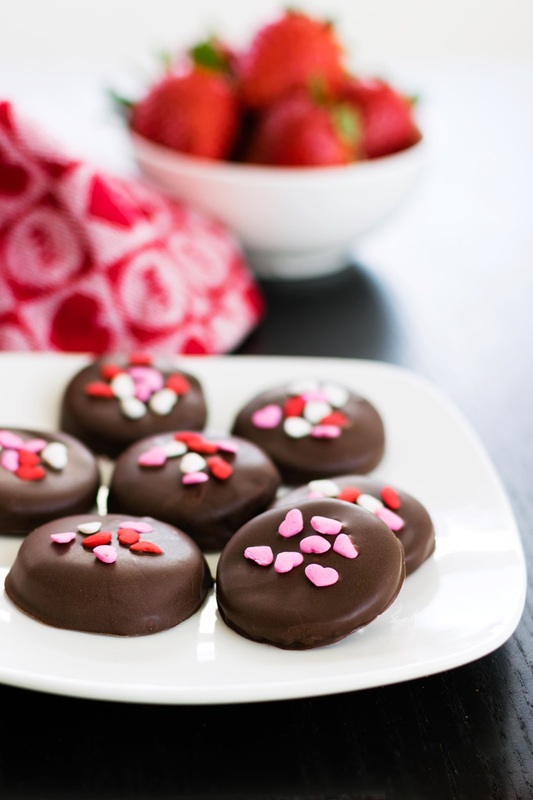 These adorable sweet treats are perfect for Valentine’s Day! And I bet they taste heavenly! They do – we think! Thanks Sonali. What a delish recipe! I love the strawberry in these. Perfect for Valentine’s Day.